The award-winning tour ‘The Making of Harry Potter’ is an experience not to be missed. Warner Bros. Studio Tour London, have created an experience that delights old and young alike. If you want to enhance that experience further, why not bring your children to stay at Grim’s Dyke – it’s architecture will have them thinking they’ve arrived at their own version of Hogwarts! Due to its location, Grim’s Dyke is the perfect base camp for your Harry Potter Experience. It’s just a few minutes from Exit 5 of the M1 and, at just over 20 minutes journey time (circa 8 miles) from your Harry Potter Experience. It’s also located in Harrow Weald, close to an important Harry Potter filming location – Harrow School. 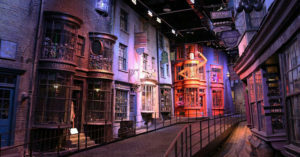 Your journey to the Harry Potter Experience will also take you past the iconic film studios of Elstree and Borehamwood. And with its tie into many a film and TV series, Grim’s Dyke is sure to delight film buffs too! The hotel has been featured in many films and TV shows over the years, including Dr Who, Agatha Christie and The Avengers. 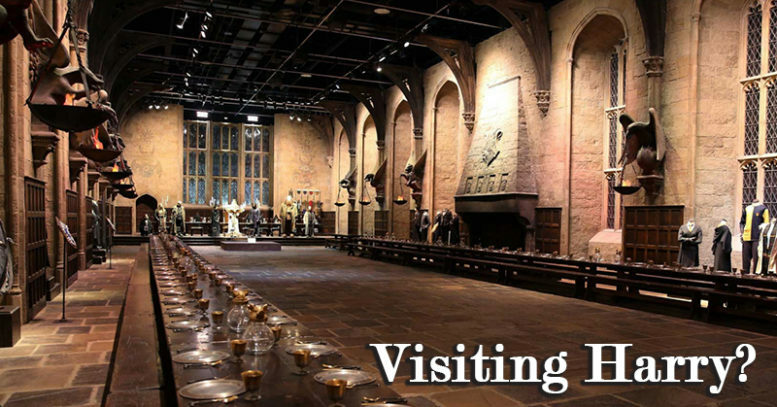 The staff will make you and your family feel welcome and the get a great deal of satisfaction, seeing the children dressed in their Harry Potter costumes, headed out for a day of fun. When the Experience is over, there are 40 acres of gardens and woodland to burn off any extra steam. Reception can provide free maps with marked walking routes, or you can borrow a laminated guide explaining some of the filming locations around the estate. Amongst the filming on the estate you have several Christopher Lee films, Ronnie Barker’s film Futtocks End, Little Britain (filmed in the Music Room), The Prime of Miss Jean Brodie (Oscar for Maggie Smith) and filming for Dr Who (The Evil of the Daleks), The Avengers, The Saint (Sir Roger Moore), The Champions, Holby City, Spyders Web, Agatha Christie’s – Endless Night, Randall & Hopkirk (Deceased), Eastenders, Sliding Doors and many more beyond. Then if you want still more, consider the wildlife, birds and nature ranging from Great Crested Newts to Muntjack Deer and the many squirrels in the woods. Recognising how convenient families found Grim’s Dyke, a decision was taken to increase the number of large family rooms. Rooms in the Garden Lodge have been enlarged significantly, to allow for additional beds. Patio doors give access to individual patio seating areas and of course, access to the wider gardens. We’ve also enlarged the bathrooms, to accommodate a separate shower cubicle, alongside the jacuzzi bath. If you’re looking for even more space, you’ll find some of our first floor rooms ideal for you needs – as they have high-quality interconnecting doors that can be opened to make an enlarged suite with two bathrooms. We understand the differing eating habits of your family members and have provided catering solutions to suit. If you don’t wish to eat in Gilberts restaurant, there’s the option of the informal Library Bar, as well as an extended room service menu, that also includes child-focused options. For individuals and couples who want a more luxurious stay, our balcony rooms are an excellent choice. All overlook the gardens and towards the orchard, making it difficult to believe one is so close to London. Not surprisingly some of our guests use the words ‘tranquil paradise’ to describe a stay at the Best Western Plus Grim’s Dyke Hotel. If your interest is in the history of the Grim’s Dyke estate, you can purchase a booklet at reception telling you much more. The estate was the final home of Sir William and Lady Gilbert (Gilbert & Sullivan) and Gilbert wrote some of his works in what is now the Library Bar. The tree-filled Grim’s Dyke itself is an earthworks, thought to date back to Roman times and earlier. The main house was built to the order of Victorian artist Frederick Goodall and he chose architect Norman Shaw to design it. Buildings designed by Norman Shaw include the original New Scotland Yard (now part of the Houses of Parliament complex) and Cragside in the North East owned by the National Trust. With so much to offer, many families book to stay with at Grim’s Dyke for a few days. This not only gives them time to enjoy the Harry Potter Experience, but it also leaves ample time to explore the grounds and the rich history of Grim’s Dyke. And of course, allows the children to enjoy staying in their own version of Hogwarts just a little longer!